BRATECK LCD Cleaning Kit. Includes: 60ml non-drip cleaning BRATECK LCD Cleaning Kit. Includes: 60ml non-drip cleaning liquid, anti-static brush and a 20 x 20cm microfiber cloth. 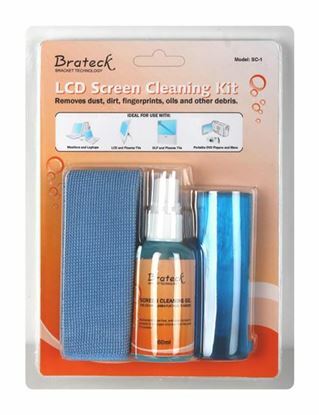 BRATECK Screen Cleaner Kit. 200ml Spray Bottle perfect for any BRATECK Screen Cleaner Kit. 200ml Spray Bottle perfect for any Screen including TV''s, Laptops, Mobile Phones, CD''s, DVD''s, Glass Furniture, Eyeglasses etc. Includes Pearl cloth & 1x Soft Brush.